I am very sad. 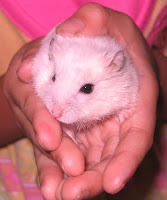 When I woke up from my nap, my mother told me that Snowy has died. I was surprised because when I came home from school, Snowy was fine. It didn't even look weak. But, when my mother was about to feed the hamsters, (I have three) she found out that Snowy didn't react at all and its body was stiff. When I checked it out after dinner, I saw Snowy's body was a bit smaller and more curled up than usual. Its eyes were also closed thighter.